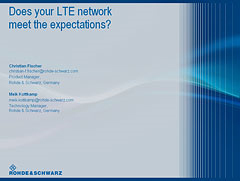 Does Your LTE Network Meet the Expectations? First commercial LTE networks have been launched and many more are expected to follow in near future. When deploying LTE it is of utmost importance to understand the key enablers of high system performance under real life conditions. Reduced data throughput experienced by the end user can have a variety of different causes. System performance and individual end user experience depend on the propagation conditions, the mobile device feedback, which is based on measurements, and the scheduling algorithm in the eNodeB. This webinar will explain how to determine the end user performance in a real life LTE network. It provides the key performance indicators to measure and to analyse in order to detect the root of a potential challenge in the network. Based on real life LTE network measurements the coherence of test results will be explained and approaches for how to solve potential issues will be illustrated.